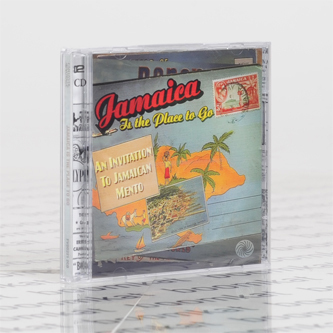 *48-track 2CD set packed with early Jamaican mento, a sequel to popular Mento, Not Calypso! comp* "Drawing mainly on recordings from the genre’s golden age of the 1950s, the 48-track Jamaica Is The Place To Go explores Mento, the island’s original popular music. Together with the American R&B favoured by local sound systems, Mento represents the origins of modern Jamaican music. History lesson aside, Jamaica Is The Place To Go offers over two hours of infectious fun: the perfect soundtrack to your summer! When Fantastic Voyage released Mento, Not Calypso! The Original Sound Of Jamaica in 2013, it was a voyage into uncharted waters for the label, but one that has proved so popular that, two years on, we are proud to present Jamaica Is The Place To Go, another 2CD survey of Jamaica’s most popular form of indigenous music pre-ska. Though often erroneously regarded as simply a variation of calypso, Jamaican mento is a distinct musical style that developed independently from its similarly styled Trinidadian cousin. Its roots can be traced to both African and European musical traditions, with its rhythmic structure and lyrical content (generally focusing on current news and carnal relations) having a profound influence upon the subsequent development of reggae. Like its predecessor, Jamaica Is The Place To Go: An Invitation To Jamaican Mento can be viewed as an instalment in Fantastic Voyage’s exploration of the origins of reggae, and follows on from the release of four highly successful volumes in the Jamaican Sound System Classics series, exploring the American rhythm & blues which was so influential on Jamaican musicians, and Youths Boogie, Mash It! and the vinyl-only Feel So Fine, all compilations of ska and the American R&B-influenced “Jamaican boogie” that predated ska."